Archbishop Emeritus Desmond Tutu received today Mike Bosman, Peter Michelson and Yoshi Shimizu – who represented the World Scout Foundation – to be informed about the Messengers of Peace Initiative. During what can be described as an inspiring meeting and one full with laughter, the Archbishop was briefed in full detail about WOSM’s Flagship programme and was stunned by what had been achieved in 2 years time. 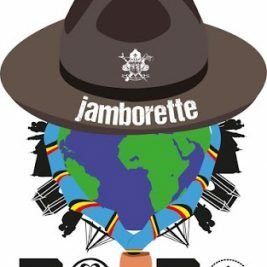 As an avid Scout, the Archbishop crasped the ideas behind the programme immediately and recognised its immens potential for the over 35 million Scouts all around the world and the multiplying effect it will have on the youth of the world who have been and will be touched by this Initiative. After sharing some amazing stories about his time in Scouting he was more then delighted when he received the MOP scarf – which he did not take off that day!